Kagawa Prefecture, located in the northeast corner of Shikoku, is home to Japan’s oldest national park, the Seto Inland Sea National Park. The prefecture resembles the shape of a half-moon, with the Sanuki Mountain Range to the south and the Sanuki Plain in the north. 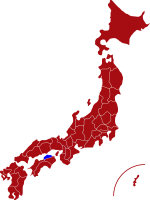 The prefecture is Japan’s smallest in size, and the plains and mountains account for about the same amount of land area. The length of the sea coast stretches more than 700 km, and the prefecture’s numerous islands are dotted throughout the Seto Inland Sea in a captivating natural setting. Throughout the year the Seto Inland Sea is blessed with a high ratio of sunny days and very little rainfall, making it one of the driest regions in Japan. For more information about Kagawa prefecture, see their official tourism website. Air - Takamatsu Airport operates daily flights to Tokyo and Okinawa. The flight time to Tokyo is 1 hour and 20 minutes. The airport runs a limousine bus service to and from Takamatsu Station which takes approximately 40 minutes. Click here for its English website. Rail - Kagawa is very easy to reach and has frequent train services to Hiroshima, Kyoto, Osaka and other major cities in Japan. 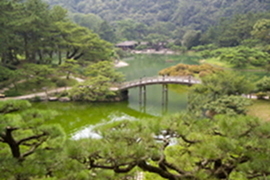 Ritsurin Garden is ranked as one of the most beautiful examples of a traditional-style garden in Japan. In front of the lake in the middle of the gardens is the 17th century Kikugetsu-tei Tea House where visitors can enjoy a traditional tea ceremony in a tranquil setting. Zentsu Ji is the birthplace of the most revered Buddhist priest Kobo Daishi and a “must visit” for temple lovers. Kobo Daishi (774-835 AD) was the founder of the Shingon (True World) school of Buddhism. 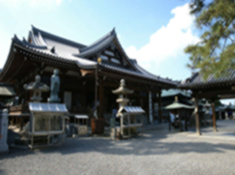 It is one of only three sacred sites that Daishi visited in Japan. Seto Ohashi (The Great Seto Bridge) is the collective name of six consecutive bridges linking Kagawa in Shikoku to Okayama Prefecture on the main island of Japan. Spanning more than 13 km, it is one of the longest two-tiered bridge in the world and takes more than 20 minutes to cross. 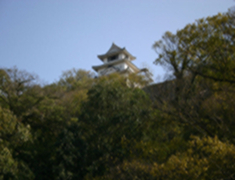 Marugame Castle - The original castle dates back to 1597 and is only one of 12 remaining wooden castle dungeons in Japan. 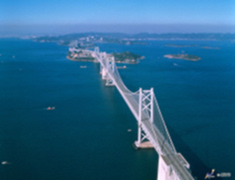 From the dungeon, visitors can enjoy beautiful views of Shiwaku Islands, Seto Ohashi Bridge and Sanuki Plain.